FOR $2 TiCKETS TO THE EVENT ! Right now, DC Shoes founder/action sports star Ken Block is one of the biggest new names in motorsports. His YouTube Gymkhana videos have attracted tens of millions of views, and wherever he goes he brings a huge spotlight of automotive industry attention. Right now, his focus is on his new event – The Ken Block Gymkhana Grid Invitational, and some of the best drivers in the world have been invited to perform in the spotlight. However, there’s another side of this event that’s going to come into that same spotlight. It’s called Mass Appeal. The Gymkhana Grid group contacted MotorMavens to help expand the reach of this event by opening Ken Block’s invitation to include the most stylish streetcars and show cars in the industry. We know who you are – the owners of the aggressively stanced street cars, the period correct nostalgic cars, the high performance track monsters, the rare exotics… the best of the best! This is why we joined with Ken Block and the Gymkhana Grid group to create MASS APPEAL – a car show that gives all of the real car enthusiasts the opportunity to come out and share that spotlight. 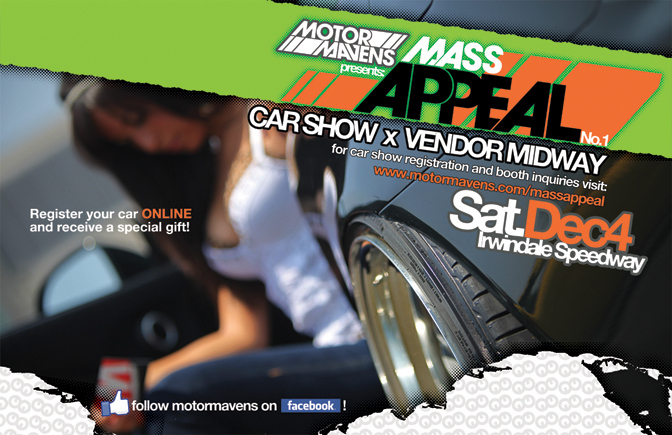 Mass Appeal is a show where those tens of millions of people will get to see what MotorMavens has already seen – you. And the hottest cars ever. You know who you are – so do we. Don’t miss the opportunity. 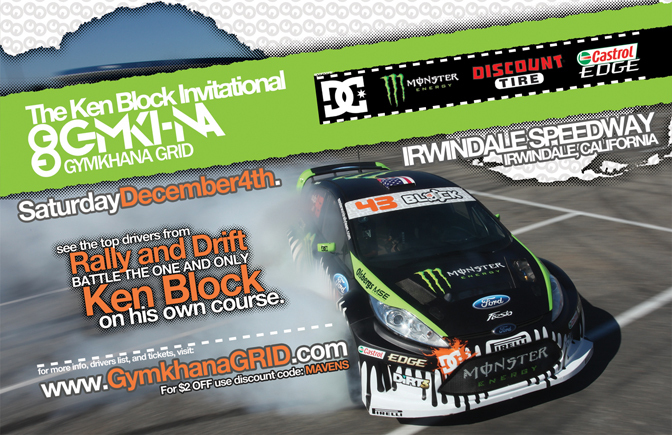 Meet us at Irwindale Speedway on Saturday, December 4, 2010. (Click here for the event schedule) Let’s show ‘em all what’s up! For this event, we plan to showcase the freshest cars that our friends and readers own for a massive MotorMavens streetcar party at Irwindale! Come out and chill with the MotorMavens Crew (and the MotorMavenettes), as we’ll be shooting an HD video of the car show to profile all the freshest street cars at the event! If you would like your super fresh, super stylish street car and/or show car to be included as part of the show, please make sure to pre-register your car to receive a limited edition MotorMavens x KenBlock Gymkhana Grid shirt and other gifts from our sponsors – DC Shoes, Monster Energy Drink, Discount Tire, Castrol Edge. PS: If you are a company interested in setting up a vendor booth at this event, please contact me directly at motormavens(AT)gmail.com for booth pricing, with MASS APPEAL VENDOR BOOTH in the subject line of the email. Last edited by LAUREN ! ; 12-02-2010 at 06:54 AM. Send a private message to LAUREN ! Find all posts by LAUREN !